Heroes, Heroines, and History: Why Do We Say That? What? How many times have I said that very phrase not realizing why I said it? So then I started wondering about other things we say every day. In my upcoming release As Good As Gold (part of the Oregon Trail Romance Collection, available 4-1-15 from Barbour Publishing) the hero finds out that it’s the heroine’s birthday. When she asks how he knew, I thought he might say, ‘a little bird told me.’ But did they say that in 1851? When I researched, I discovered that the phrase can be traced back to the Bible. Ecclesiastes 10:20 (KJV) “Curse not the king, no not in thy thought; and curse not the rich in thy bedchamber: for a bird of the air shall carry the voice, and that which hath wings shall tell the matter.” To further insure the phrase’s longevity, it was used and popularized in a song by Harvey Brooks in 1947. Here are a few more popular sayings and their (suspected) origins. It is widely believed that this phrase has roots in medieval times. It was thought that if newlyweds drank mead (a wine made from honey) each evening for one month (which is a cycle of the moon) they would be blessed with a male heir in that year. Another plausible explanation is that the letters p & q are easily reversible. When a printer was running a press, the boss would tell him to ‘mind his p’s and q’s.’ But then again, they could have easily said b’s and d’s. But that doesn’t have quite the same ring to it. After discovering scratch marks on the underside of some coffins and having the ‘dead’ come back to life at funerals, the fear of burying someone alive became very real. (Keep in mind, this is before anyone knew what a coma was.) This led to the family tying a string to the deceased’s wrist. The string was attached to a nearby tree and bell. If they happened to wake up, they rang the bell and were saved. A “pipe dream” once referenced the dreams experienced by those who smoked opium out of a pipe. Today, it refers to a plan or dream that is impossible to achieve. During a game of cards, a token was used to show who was next to deal. This marker was a bit of buckshot or buck. In order to indicate who had the dealer’s responsibility, the players would literally pass the buck(shot). Some claim the phrase originates from a time when the whole household shared the same bathwater. The head of household would bathe first, followed by any men who lived there. The mistress of the house went next followed by the other women. Then the children bathed in order of their ages until it became the baby’s turn. Supposedly the water would be so dirty that a baby could accidentally be 'tossed out with the bathwater'. What’s your favorite idiom and do you know its origins? Feel free to share! Everyone who leaves a comment between now and March 31 will be entered into a drawing to win a paper copy of The Oregon Trail Romance Collection featuring novellas written by some of your favorite Christian authors. 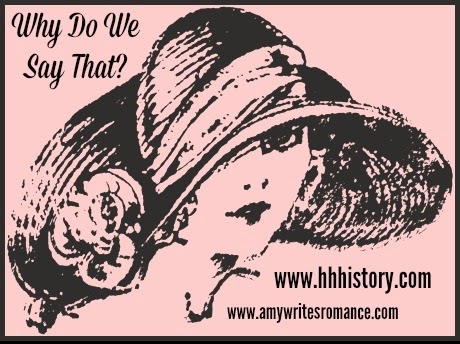 Labels: Amy Lillard, idioms, Oregon Trail Romance Collection, sayings, why do we say that? Since horses' gums recede as they age, which makes the teeth appear to grow long, checking the teeth of a horse given as a gift is a way of checking for old age. From earlier given horse: "No man ought to looke a geuen hors in the mouth." —John Heywood, 1546. Although uncertain, the origin can be traced even further to St. Jerome's "Equi donati dentes non inspiciuntur. ", The Letter to the Ephesians, circa AD 400. Proverb - don't look a gift horse in the mouth-Do not unappreciatively question a gift or handout too closely. This was so much fun! Thank you Amy! I really enjoyed the blog!! Loved hearing these Phrases and meanings. Congrats, Heidi. I am posting for Amy. You are the winner of the contest. Please email her at amylillard918@gmail.com. Thanks! It is interesting to know where phrases come from. We often never think about it. I have a friend from another country and as she is listening to a conversation she will often ask about something she hears. That makes you stop and think about phrases we use everyday! A lot of phrases we use come from the Bible, like "at your wits end" or "a drop in the bucket" or "the handwriting is on the wall." I've read some phrases that secular writers use as cliches, and they don't realize they are quoting the Bible. My parents used to say "Sleep tight and don't let the bed bugs bite," when they put me to bed as a little girl. I found out the expression came from two origins - one, that the mattress was held up by ropes crisscrossing the frame. With wear, the ropes would sag, so the they had to be stretched tight again. Also, mattresses and pillows used to be stuff with many things, but in the South, Spanish moss was common. Often there were bugs int he moss. This is before we heard to today's "bed bugs." I have always lived in an area where agriculture was the main source of income so it should not be surprising that two of the idioms that I have heard all of my life pertain to farming. I'm not sure of their origin but I imagine it was a very wise farmer! "Don't count your chickens before the eggs have hatched." I was always warned that I should not make plans for something that might never happen. I sometimes put my own spin on this idiom and advise my daughter not to worry about something that might happen! The second idiom also deals with eggs. "Don't put all your eggs in one basket". Don't invest all of your money in one place or do not put all your resources in one possibility. I am a retired librarian and I was privileged to go to our Senior Citizen Center once a month to present a program. I once did a program on "Favorite Sayings" and they loved it. Thank you for this post. "The early bird gets the worm"; and I have no idea where it came from. Sounds like a fun collection of stories in this book! rmaney(at)firstarpchurch(dot)org. I love those old sayings. Learning where they came from can be enlightening as well as entertaining. As an ESL teacher, I run into a lot of idioms that my students want to know about. My favorite from around here in KY where I live is "that dog don't hunt" - always fun to explain to my internationals what it means! But I don't really know its origins.